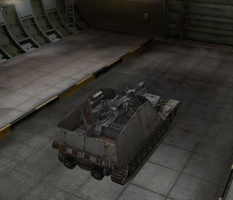 The Hummel is a German tier 6 self-propelled gun. 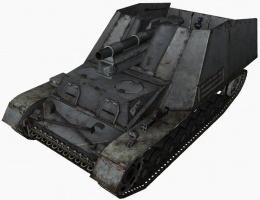 In the autumn of 1942 the Alkett company started the development of a new SPG with a 150-mm gun. 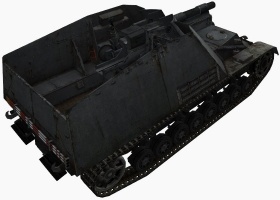 To boost new vehicle production, it was planned to use the readily available components of Pz. III and Pz. IV vehicles. The SPG was made on the same chassis as the Nashorn heavy tank destroyer. A total of 714 vehicles and 150 ammunition carriers that used the same chassis were built. Built on the Pz.Kpfw. 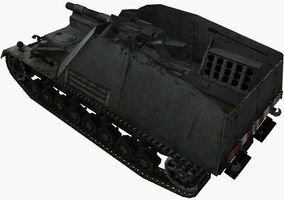 III/IV chassis, the Hummel is a very well-rounded piece of artillery. 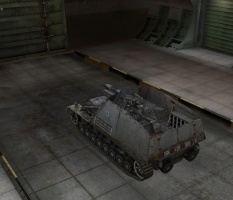 The second gun can take down or seriously damage any heavy tank. This, combined with a good accuracy, makes it one of the best T6 SPGs. 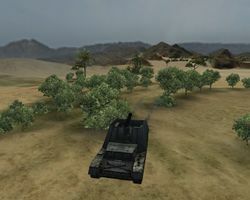 It can also be played in "tank destroyer mode" (direct fire) when needed. However, because of its height and low gun depression, going into a short-range gunfight is not advisable, since you're likely to just overshoot anything in front of you. 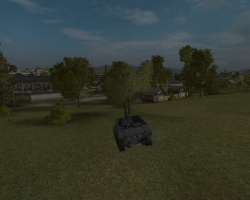 Interestingly, it was the first SPG to be introduced in the game, one of the first seven tanks created when it was still in Alpha testing. The Hummel leads to the G.W. Panther. 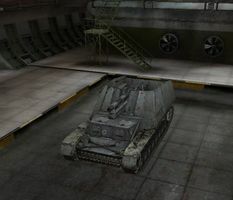 The Hummel starts off as a larger version of the Grille with the same gun. As soon as the upgraded gun is bought, however, everything changes. The second gun has a slow aim speed compared with other guns, and this can be quite frustrating in the beginning. If time and patience are taken, however, this SPG will perform well. The gun does a nice amount of damage and penetration and can easily stay competitive in tier 8 games. It has a good traverse arc without having to turn the whole vehicle. The 18 rounds carried won't run out as often as they would in the Grille, due to the lower rate of fire. Fire discipline must be taken to be effective; make sure to let the aim circle shrink all the way without taking premature shots, as this is the only way to chance a hit. Otherwise, it'll be a waste of a shell. The 27 seconds of reload time is very long however; it may seem that you can fire, relocate, re-aim, and load for your next shot, but the long aim time will leave you with ripe targets you cannot accurately hit. Unfortunately, only the radios carry over from the Grille. Research and install the engines first, as they are cheap XP wise. The upgraded suspension is necessary to mount the second gun. Next, research the 15 cm sFH 18 L/30. 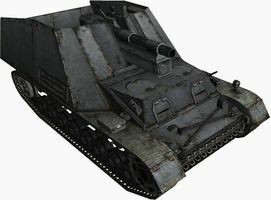 Based on the experiences gained in the early stages of fighting on the Eastern Front, in late 1941, plans were laid for the development of artillery support vehicles, including a howitzer carrier based on the Panzerkampfwagen III’s chassis. Its main role was to provide other units with mobile artillery support on the battlefield. In early 1942, one prototype based on the Panzerkampfwagen III’s chassis and armed with a 105mm leFH17 howitzer (with muzzle brake) was constructed. 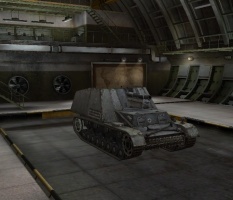 Its design was rejected in favor of using the Panzerkampfwagen IV’s chassis. This design was accepted, and one prototype, based on the Panzerkampfwagen IV’s chassis and armed with 105mm leFH17, was produced. In late July of 1942, it was decided to replace the gun with the more powerful 150mm sFH 18 L/30 howitzer (without muzzle brake) based on the special chassis by Alkett/Rheinmetall-Borsig designated Geschutzwagen III/IV. It combined components of both the Pz.Kpfw. III (mainly Ausf. J: driving and steering mechanism) and Pz.Kpfw. IV (mainly Ausf. F: suspension, engine, and cooling system). Originally, the Hummel (Bumblebee) was planned to be an "interim solution" until a specially designed gun platform / chassis was developed. This page was last modified on 19 July 2018, at 17:55.